Max Moran began his studies in music with violin lessons at the age of five. He later became interested in the guitar and soon found that the bass was his calling. A summer spent at Jazz Aspen JAS Academy, a renowned jazz residency program, was instrumental in his early growth and development. While enrolled there he met and had the opportunity to share the stage with bass master Christian McBride and piano virtuoso Benny Green, both of whom were impressed with Max’s playing and who encouraged him to continue to pursue his musical ambitions. As a student at NOCCA (New Orleans Center for Creative Arts), Moran experienced a four-year mentor-ship under legendary clarinetist and pioneer jazz educator Alvin Batiste and bassist Chris Severin (Dianne Reeves, Dr. John). He earned a gig as the bassist in Batiste’s group, the Jazztronauts, as a junior in high school after sitting in on one of his performances. At 17, Max got his first opportunity to play with Donald Harrison through the recommendation of pianist, Conun Pappas. Max continued to study and perform with Mr. Harrison throughout high school as a student in the Tipitina’s Internship Program (T.I.P) and has been, for the past several years, the electric and acoustic bassist in the Donald Harrison Quintet and the Congo Nation Band where he has grown artistically and professionally. The experience has exposed him to a great teacher and mentor in saxophone legend Harrison and has afforded him the opportunity to play on a worldwide stage with first class musicians. In addition, Moran has performed and recorded with artists such as Nicholas Payton, Christian Scott Atunde Adjuah, Herlin Riley, Shannon Powell, Leo Nocentelli (The Meters), Bernie Worrell (Parliament/Funkadelic),Davell Crawford, Jonathan Batiste, and Allen Toussaint. 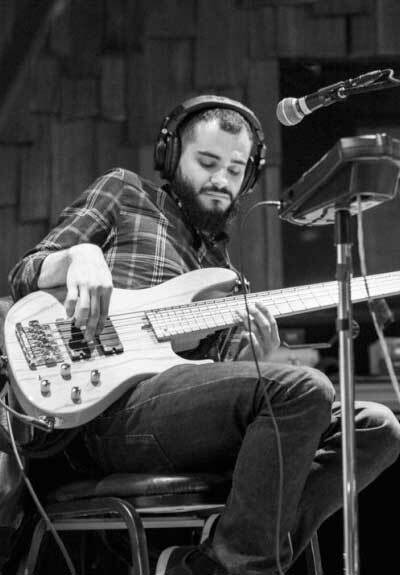 He now co-leads The Bridge Trio along with Pappas and drummer Joe Dyson, fronts his own group, Neospectric, and is an instructor at the Tipitinas Internship Program.